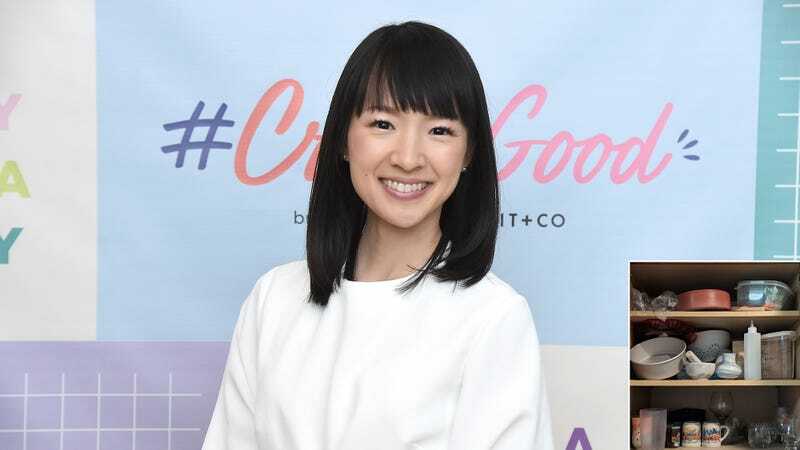 BROOKLYN, NY—Shocked, disillusioned, and even somewhat betrayed by the unlikely pairing, fans of best-selling author and decluttering guru Marie Kondo were reacting with general disapproval Friday at the news that the organizing consultant has been dating an untidy kitchen cupboard since July of last year. “I can’t believe she has the gall to enter people’s homes, rummage through all their personal belongings, and tell them to throw out their things while she’s out there sharing a perfectly made bed with a messy old cupboard,” said Tidying Up With Marie Kondo enthusiast Catherine Walstrom, 31, who claimed she lost all faith in Kondo’s signature KonMari method after seeing photos of Kondo attending a formal dinner with the unkempt storage unit as it overflowed with unused tea kettles, old recipe books, and promotional coffee mugs. “I’ve spent hours learning to fold my shirts perfectly, so it seems hypocritical for her to go around with a beat-up cabinet that smells of expired coupons. I guess I just imagined her with a clear plastic bin—one featuring handles in which everything is visible, the contents arranged to stand vertically—but seeing her with that loose-hinged disaster just makes me feel like the magic of tidying up is nothing but a big lie.” More forgiving fans theorized that perhaps the cabinet did indeed at one point spark joy within Kondo, and that she simply may not yet be ready to thank the dilapidated cabinet for its service and toss it aside.